No, you're not seeing double....I'm just using up my scraps like a good girl!! My post is featuring the sketch from Twisted Thursday and the twist was to add either flowers or buttons. I chose buttons because I felt they went with the design elements of my card. Thanks ladies for another great challenge!!! School starts back tomorrow....I'm wishing for summer already!! I need to get the rest of the laundry done and figure out what to cook so I'm off! Thanks so much for stopping by and have a great rest of the day!! I love this one. The colors and the papers are fabulous. I'm sooooo glad my DH does the cooking! Jackie, you rocked the challenge, this is spectacular. Super take on the sketch and such lovely details! Thanks so much for playing with us. Hi Jackie, Nice card. I like the glitter added to the flowers. I love the repetition on your card - great colors too. This is my first visit to your blog, Jackie. 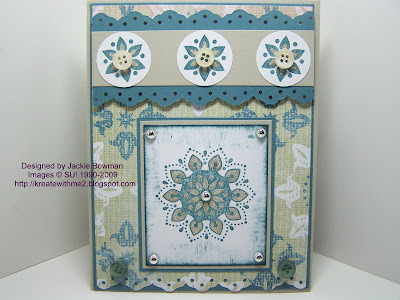 Love the way you are using that eyelet border punch. It really adds something special to your card layouts. Jackie, this is so pretty!! Great colors and the buttons are prefect for your layout and design!!! TFS! Jackie this is a beauty, I love the the blue bayou, and great layout, dont you just love punches :). Very beautiful and sweet card - luv the color combo! This is so beautiful! I love the colors and and the layout! Jaackie, love this paper, it was one of my favs. Love the look of your card, you did a great job. BTW only 40 more days of school for me and then (insert music here) "school's out for summer!" Beautiful as usual Jackie! I'm also trying to finish up laundry! I'm wanting warm weather badly too! jackie! this card just knocks my sock off! i truly LOVE everything about it..the colors..layout/sketch..punched edges..bling..colors..(I esp love the colors..A LOT)..
this is a wonderful wonderful cards jackie! TFS! Another fab card, Jackie! You rocked this challenge! Very beautiful. Flowers remind me of a Pennsylvania Dutch design. How funny. I saw this card pop up and thought "Wait. Haven't I already seen this?" But after scanning down I see that you posted your other card a few days ago. And this one is a bit different. I like this one just as much as the original because I like the paper and colors. Good for you for using scraps. Good for you on using your scraps! I try to start w/ my scraps first too! Great job on your card. So pretty! This is absolutely beautiful! I love the glitter and the scallops and the colors. Jackie this is lovely. Great job on the challenge as always. Love this, jackie!! It's got so much to it!! Details!! Great card! this is beautiful and I love the colors that you used on this one Jackie, so pretty! Jackie, this is STUNNING! The soft, subtle colors and all the beautiful elements are just breath taking. Thanks so much for playing again this week! I love your work! This is gorgeous, Jackie...I love the colors, papers, layout, love every little detail!! I'm really proud of you for using your scraps, too...you have inspired me to gather up the scraps on my counter and make something in the morning...I'll call it my Jackie good girl challenge!!! Whoohoo!!! I have this stamp set and I have never used it!!! I love it and those colors are so so so pretty with it!!! Awesome job on this card too!!! how lovely, love the blues! HAHA - I thought I was seeing double! I was like I swear I commented on that card but maybe I am crazy since it was posted more recent than I remember! Love the pretty designs and the blue tones in this!! :) TFS! As always, very gorgeous! I love all of your cards. WOW This is fabulous! Can't wait to case it. what a great take on that challenge. you do some wonderful work. Oh so pretty, love the colors and design! What a beautiful card!!! And congrats on winning this week! Your cards are truly magnificent and are a true work of art -- thank you for sharing your gift with us :) blessings!